Celery (Apium graveolens) is believed to be the same plant as selinon, mentioned in Homer's Odyssey about 850 B.C. Our word "celery" comes from the French celeri, which is derived from the ancient Greek word. The old Roman names, as well as those in many modern languages, are derived from the same root word and sound remarkably similar. This indicates a rather recent wide distribution and use of celery. Smallage, a plant now cultivated in gardens for flavoring purposes, is apparently "wild" celery, the plant that has been known as celery in the Mediterranean countries for thousands of years. Wild celery grows in wet places over Europe, the Mediterranean lands, Asia Minor, the Caucasus, and southeastward toward the Himalayas. It is believed to have originated in the Mediterranean area. Chinese writings of the 5th century after Christ mention it. The oldest record of the word celeri is in a 9th-century poem written in France or Italy, giving the medicinal uses and merits of the plant. When its culture in gardens was begun in the 16th century in Italy and northern Europe, it was still a primitive plant, like smallage, and was used for medicinal purposes only. 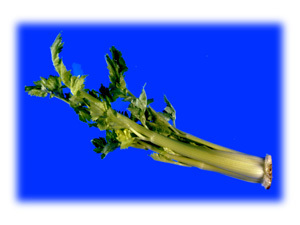 In France in 1623 use of celery as food was first recorded. For about a hundred years thereafter its food use was confined to flavorings. In France and Italy, by the middle of the 17th century, the little stalks and leaves were sometimes eaten with an oil dressing. In the late 17th and early 18th centuries, in Italy, France, and England, were seen the first evidences of improvement of the wild type. Gardeners also found that much of the too-strong flavor could be eliminated, making the stalks better for salad use, by growing the plants in late summer and fall, then keeping them into the winter. By the mid-18th century in Sweden, the wealthier families were enjoying the wintertime luxury of celery that had been stored in cellars. From that time on, its use as we know it today spread rapidly. We do not know what group of European colonists brought it to America, or when, but four cultivated varieties were listed here in 1806. All through the 19th century in America, England, and much of Europe, it was believed necessary to blanch the green edible portion of celery to rid it of unpleasantly strong flavor and green color. This was done by banking the plants with soil. Some kinds, like Pascal and Utah, that remain green when ready for eating, are now considered to be of the finest quality. Many so-called "easy-blanching" or "self-blanching" varieties have appeared in the past 50 years. Generally, these self-blanching sorts are inferior in quality to the best green varieties, but can be grown successfully under less favorable conditions of soil and climate. Celeriac, or turnip-rooted celery, is a kind that forms a greatly enlarged, solid, more or less globular body just below the soil surface. It is not used raw, but is especially suited for use in soups and stews. Celeriac was developed from the same wild species as were our present improved varieties of celery, and at about the same time. About 1600, Italian and Swiss botanists gave the first descriptions of it. A hundred years later it was becoming common in Europe, but was hardly known in England. It has never become highly popular in England or the United States, but is a common vegetable all over Europe. Parsley (Petroselinum sativum) belongs to the same family as celery, and its Latin name reveals a relationship to the very old Greek selinon mentioned above. In the 4th and 3rd centuries B.C. the Greek word definitely meant "parsley." The Latin Petroselinum means "rock parsley," referring to its habit of growing in rocky places. The plant is native to the same area as celery. In contrast to celery, parsley has a long and definite ancient history as a food plant. It was well known as a flavoring and garnish by the ancient Greeks and Romans, who even used it in festive garlands. Eating it was supposed to ward off intoxication! Both the crowded, dense-leaved type and the broad open-growing type were described by Theophrastus in the 4th century 13 B.C. The curled and plain types were common to the Romans in the 1st century or before and in northern Europe in the 13th century. Parsley supposedly was introduced into England from Sardinia in 1548. European colonists brought it to America in the 17th century. Parsley, like celery, produces a "turnip-rooted" form, commonly called Hamburg parsley, which is used in the same way as celeriac.